Trolls who attempt to undermine this important advocacy work are not even doing so with the facts at hand. The predatory nature of these types of individuals has actually been well-documented and researched by experts such as Dr. Robert Hare, Dr. Karyl McBride, Dr. Lundy Bancroft, Dr. Martha Stout, therapist Christine Canon de Louisville and Dr. George Simon, many of whom have worked with abusers and/or abuse survivors as clients. The reality of narcissistic abuse has been validated not only by survivors but also numerous mental health professionals in the field. Cyberbullies and trolls who attempt to stifle the truth about narcissistic abuse often do so by trying to silence a truth that could potentially set another survivor free. 1. 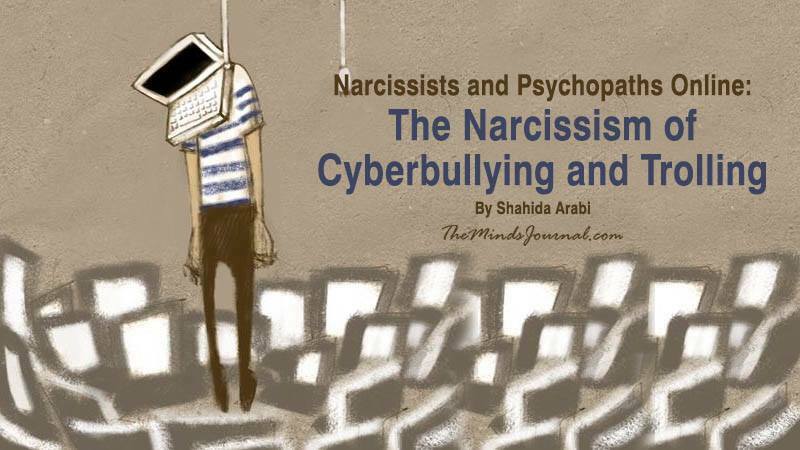 Rather than engaging in healthy debate and respectful disagreement, cyberbullies and trolls distinguish themselves from normal people who disagree by staging personal attacks on character instead of providing evidence against the argument that they claim to have problems with. Instead of respectfully crafting a compelling rebuttal to your argument, while thoughtfully considering your points, they’re more prone to verbal diarrhea which consists of insults, name-calling, word salad, circular logic and provocative overgeneralizations deliberately aimed to get a rise out of you. You can easily distinguish a troll from a person providing helpful critique by the way they speak to you; if they are condescending and contemptuous in a way that is unwarranted and overbearing, you’ve got yourself a toxic individual. Cyberbullies and trolls purposely misunderstand, misinterpret and misrepresent your perspective as a way to discredit you. They ignore any part of your argument that may be credible and attempt to paint it in black and white so they can feel justified in their bullying. They demean your credentials and diminish your arguments with nothing but their own ill-informed opinion. They are unlikely to provide relevant evidence regarding their viewpoint, and if you dare to provide evidence to the contrary, they will become narcissistically injured and rage at you. They may even bring up personal details or assume things about you that have nothing at all to do with the matter at hand. They are, like many narcissists in intimate relationships, perpetual boundary-breakers. Some cyberbullies give up eventually if they don’t get the response they were looking for, but others will keep hunting for more of a reaction and provoking you, even going so far as to create multiple accounts in order to continue to harass you. Like narcissists in intimate relationships, they use the anonymity feature of cyberspace to employ triangulation techniques with their “fake” accounts to show “support” for – who else? Themselves. When you do respond in a way they’re not accustomed to, trolls and cyberbullies suffer a kind of narcissistic injury and resort to low blows and attacks. Some cyberbullies are satisfied when you give them a quick ego stroke, like a “You’re right” to their insult and go away. Others are much more malicious. When you give them radio silence or choose to report their harassing behavior, they come after you. They may even follow you onto personal social media accounts because they dislike being ignored. Like narcissists in intimate relationships, they cannot stand when a victim of their bullying moves forward without valuing their opinions.